Five fire engines remain at the scene of a 'serious' fire in Portslade which saw the sky over Shoreham Port filled with smoke this morning. East Sussex Fire and Rescue Service said it has 'scaled down' the incident which saw ten fire crews tackling the blaze at Chandler Building Supplies in Shoreham Port this morning (March 15). 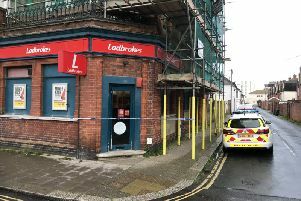 Emergency services were called at 8.44am to the blaze at a store room, and the seafront road was closed soon after as firefighters tackled the fire. A fire service spokesperson said: "There are now five fire appliances on the scene. Kingsway road has been cleared of fire debris to enable Sussex Police to lift local road closures. "Whilst the smoke at the scene has significantly diminished, the advice is still to keep windows and doors closed. "A joint investigation between Sussex Police and East Sussex Fire & Rescue Service has begun to determine the cause of the fire." For videos, pictures and eyewitness reports of the incident, click here.